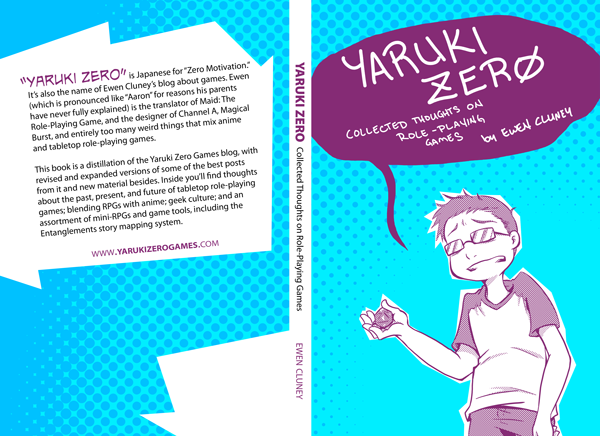 Yaruki Zero: Collected Thoughts on Role-Playing Games is a book that is at turns a distillation of my ideas about RPGs and a memoir of my life as an RPG guy. Roughly half of it is revised and expanded versions of material that has appeared on the Yaruki Zero Games blog, but there’s quite a bit of new material too. It includes my thoughts on the past, present, and future of RPGs, on RPGs and anime, on geek culture, and a whole section just on D&D. It also contains some mini-RPGs and other game material. The $12 printed book is digest-size (6″x9″) and 217 pages. The ebook is $6 and available in PDF, mobipocket, and epub, and thus is compatible with most e-readers, including the Amazon Kindle, Barnes & Noble Nook, and Apple’s iBooks app. What about IPR and the unStore? I’ll probably look into them later (and see what else is out there for that matter), but for right now I’m kind of tired of messing with this stuff. IPR in particular seems more appropriate to pursue once I’ve got some full-on game products for this book to be a companion to.